The Assassination of Jesse James by the Coward Robert Ford stars Brad Pitt and Casey Affleck as Jesse James and Robert Ford in Andrew Dominik's gritty, intelligent western. 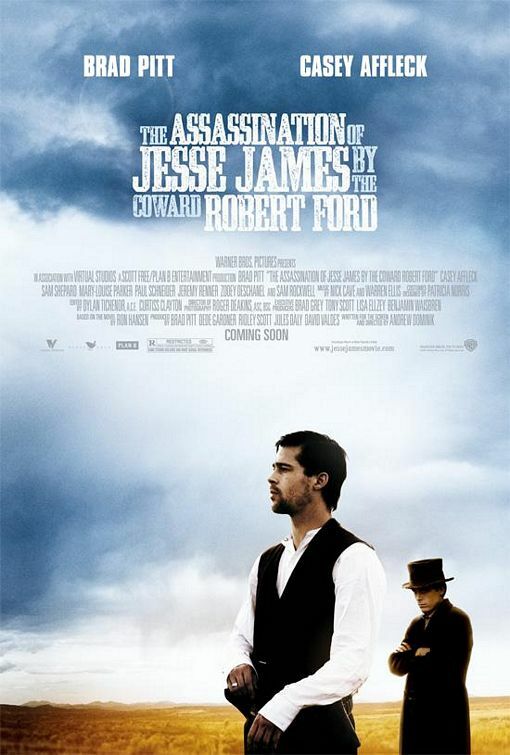 The film focuses on the last year of Jesse James' life and his relationship with his eventual killer, the star struck Robert Ford. It's not your average gun toting Cowboy movie by any stretch. There's a lurking sense throughout of something bigger at play, Pitt's performance of James hinting at a growing isolation and paranoia as his world closes in around him. He's charismatic and almost likeable, but his manic out bursts and displays of chilling indifference to the lives of others are constantly bubbling beneath the surface. The movie, without doubt, living up to the myth within an historically correct construct. Affleck steals the movie from Pitt as Ford. The film knowingly plays to the man's memory (with its title) whilst presenting him as something quite different. He's obsessed with James, almost to the point of celeb stalker, knowing his shoes size and having a box under his bed full of James' memorabilia. He's mocked throughout by the James gang and his family, eventually realising that the only way he'll gain the notoriety of his mentor is by being the man to bring him to justice. Affleck brings a depth to the character, imbuing him with something far more than the cowardice for which he became so renowned. Dominik giving the impression that James sets him up as is eventual killer, turning his back to Ford at the pivotal moment to make sure that his assassin shoots him in as cowardly a way as possible. The film is beautifully shot throughout, from the wide open spaces and brief images of clouds shifting and moving to the studied close ups of its subjects. Even the violence is almost balletic in the brief moments when the movie shifts gears. The soundtrack by Nick Cave (who gets a small cameo) and Warren Ellis is hauntingly beautiful, adding to the sense of claustrophobia and depression that filled James' world. Knowing what's coming doesn't detract from James' eventual killing, it looks and feels like murder and is shocking in its simplicity. James, building the fear in Ford and his brother to the point that they both draw their guns, there's even some ambiguity in the film about whether it's Robert or his brother that actually commit the offence. It's a film that despite having a well known story is still a fascinating watch largely because of the performances of the two leads but also a superb supporting cast who all add weight to the movie. In particular Sam Rockwell (Moon), Jeremy Renner (The Hurt Locker) and Paul Schneider bring the James gang to life as a rag tag bunch of very different criminals brilliantly. If it feels a little plodding in places you sense it's deliberate, so that by the end of the film you fully believe Ford's regret, yet understand his motivation and have genuine sympathy for him. It's a character study, brilliantly acted throughout and filmed with a loving touch by its director.